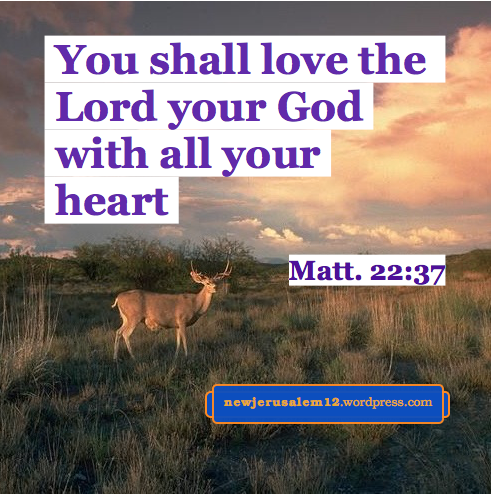 We should love God with our whole being (Mark 12:30) so that we may cooperate with Him for His purpose (Rom. 8:28). 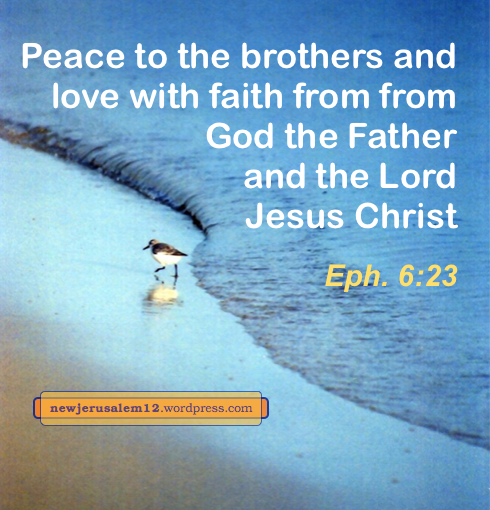 Faith and love are excellent virtues which come to us from and unite us with the Triune God. This life union carries us through sufferings to glory – the glorious expression of the Triune God who is our life and our living, the consummation of which is New Jerusalem. This wonderful faith and this super-excellent love are out of the Triune God, who earnestly desires to be joined to us to be our everything. This Triune God passed through the process of incarnation, crucifixion, resurrection from the dead, and ascension to the heavens on high and was ultimately consummated as the life-giving Spirit (1 Cor. 15:45). This Spirit of life (Rom. 8:2), who includes divinity, humanity, and Christ’s crucifixion, resurrection, and ascension and is the reality of the all-inclusive Christ (John 14:16-20), dwells in our regenerated spirit (Rom. 8:16; 2 Tim. 4:22). When we contact this Triune God through prayer and by looking to Him…He infuses Himself into us in many ways to become the faith within us toward Him and the love outside of us toward those who belong to Him. Such faith and such love are the reality and expression (1 John 4:8, 16) of the Triune God — the Father, the Son, and the Spirit — in whom we believe and whom we worship and receive. The Triune God being our everything is an inward, hidden reality today that will be manifested in glory upon the Lord’s return and will be displayed to the fullest extent in New Jerusalem. Lord, keep me in Your faith and love so that You may live in me today and bring me and many others onward to New Jerusalem. Part of the quote above, about wonderful faith and super-excellent love, has been set to music. Listen here. We, all the believers in Christ, as members of the corporate bride, get ready by cooperating with the Spirit’s work in us. Our cooperation hastens the readiness of the bride and the Lord’s coming. Two portions in Matthew (one in the next post) speak about our readiness. Matthew 24 charges us to watch and to be ready for the Lord’s coming. His coming is both for judgment and for presenting the church to Himself glorious as His prepared bride. The charge to be ready is in the context of historical and present unreadiness. These people are a warning to us. I see three principles to safeguard us. First, the Lord says, “Heaven and earth will pass away, but My words shall by no means pass away” (24:35). Lord, make Your words always living to us. Third, in Gethsemane the Lord put watching and praying together. To watch is to be alert in fellowship with the Lord in prayer. Lord, make me a praying person. These three actions get us ready for the rejoicing of Revelation 19 and onward to New Jerusalem. Bible verses quoted in these posts are from The Holy Bible, Recovery Version, published and © by Living Stream Ministry, Anaheim CA, 2003. The New Testament of this Bible, with its outlines, footnotes, and cross-references, is at online.recoveryversion.org; this too is © by LSM. New Jerusalem is “a bride adorned for her husband.” And, “The foundations of the wall of the city were adorned with every precious stone” (Rev. 21:19. If we love the worldly things, we would be very disappointed with New Jerusalem. But God will turn our hearts to Him to love His ways. The adorning of the foundations of the wall of New Jerusalem follow the divine principle of God’s operation in our being. These precious stones, precious to God, are believers who have been transformed by the Spirit’s work in them throughout their human lives. This adorning testifies both the riches of God and the complete cooperation of these believers with the Spirit. _____All our being wholly fill. This is our path to New Jerusalem and its adornment. New Jerusalem is a marriage. The relationship of the Lord and the city, His bride, is in love. Last month there were six posts on this love from verses in Ephesians, The Love of the Marriage of the Lamb Presented in Ephesians. At the beginning of Ephesians God “chose us…to be holy and without blemish before Him in love.” At the end of Ephesians “Grace be with all those who love our Lord Jesus Christ in incorruptibility.” Approximately 30 years after Ephesians was written, the Lord spoke to them again in Revelation 2:1-7. The Lord commended the Ephesians for their work and labor and endurance and hating what He hates (v. 2-3, 6). However, He also said, “I have one thing against you, that you have left your first love” (v. 4). The Lord focused on this one lack among them because loving Him is so important. We go to the marriage of the Lamb in love and with love. The Lord’s word to the Ephesians is also to us: “He who has an ear, let him hear what the Spirit says to the churches” (v. 7). The Lord’s instruction to us is “Remember therefore where you have fallen from and repent” (v. 5). We need the rebuke in verse 4 and the reminder in verse 5. Thank the Lord that there is still time to repent! Lord Jesus, forgive me for letting my love to You fade. Please keep my ear open to the Spirit and remind me always to love You. Photo courtesy of U.S. Bureau of Land Management. The Lamb is Jesus Christ and the wife of the Lamb is the holy city New Jerusalem. Their marriage is in love, the love of God to us and our response to and with His love. Ephesians concludes, “Grace be with all those who love our Lord Jesus Christ in incorruptibility.” The Lord certainly desires that we love Him. This love is the first commandment (Mark 12:30) and in response to this love He and the Father make their dwelling with us (John 14:23), a precursor of New Jerusalem as their eternal dwelling. We are to “love our Lord Jesus Christ in incorruptibility.” Our love must originate from God because our natural love is corruptible. He is the only incorruptible One and New Jerusalem will be an incorruptible city to match Him as His wife. In contrast, the Gospels have examples of corrupted, selfish love. In Matthew 20 the mother of James and John, who loved the Lord, asked that her sons sit on His right and left in the kingdom. In response the Lord told His disciples not to strive for greatness but to be a servant, even a slave. We have been regenerated of incorruptible seed (1 Peter 1:23) and all our love for the Lord should spring from this. Lord, thank You for Your love to us that we may love You in purity from now unto New Jerusalem. Photo by NASA, ESA, STSci; courtesy of NASA. “Let us rejoice and exult, and let us give the glory to Him [the Lord our God the Almighty], for the marriage of the Lamb has come, and His wife has made herself ready” (Rev. 19:7). “The bride, the wife of the Lamb” (21:9) is “the holy city, Jerusalem” (21:10). The love of this marriage is foreseen in the love of God for us, Christ’s love in giving Himself for the church, and our loving Him in return. Prior posts considered this love in Ephesians 1, 2–3, 4, and 5. All that we have is “from God the Father and the Lord Jesus Christ” so that the Triune God can bring us all the way to New Jerusalem and the marriage dinner of the Lamb. * Part of footnote 2 on Eph. 6:23 in the Recovery Version Bible, footnote written by Witness Lee, Bible © 2017 by Living Stream Ministry. Titus 3, “This Wonderful Faith and this Super-Excellent Love” in song. More on faith and love, in Luke 7, John 21, Gal. 5, Eph. 3, and 1 John 3. Photo by Mary Hollinger, courtesy of U.S. National Oceanic and Atmospheric Administration. The eternal marriage of the Lamb, Jesus Christ, and the bride, New Jerusalem, is presented in Revelation 19:7-9 and 21:2, 9-11. This marriage is in the love of God which becomes our love to Him and to one another. Ephesians exhorts to walk worthily of God’s calling (4:1) and to “walk in love” (5:2*). Our walk in love is “as Christ also loved us and gave Himself up for us” (5:2). When we experience the love of Christ to us and respond by loving Him, our walk becomes worthy. Lord Jesus, we love You. Ephesians 5:22-33 speaks about human marriage as a picture of the eternal marriage. “This mystery is great, but I speak with regard to Christ and the church” (5:32). 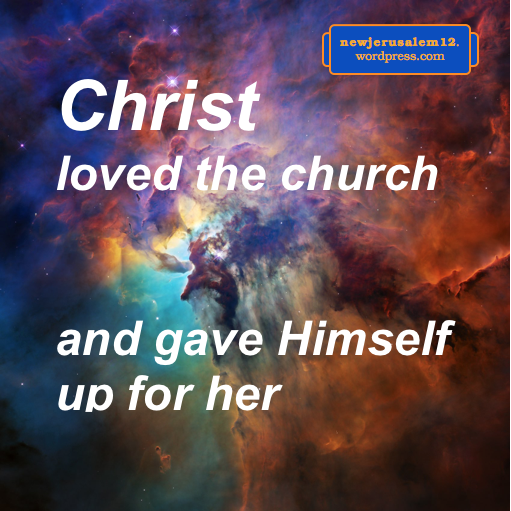 “Husbands, love your wives even as Christ also loved the church and gave Himself up for her” (5:25). The wife’s subjection [5:22] plus the husband’s love [5:25] constitutes a proper married life and typifies the normal church life, in which the church is subject to Christ and Christ loves the church. ** This normal church life is a foretaste of New Jerusalem. Christ loved the church and gave Himself “that He might sanctify her, cleansing her by the washing of the water in the word” (5:26) with the goal “that He might present the church to Himself glorious…holy and without blemish” (5:27). The characteristics of the church in 5:27, which match New Jerusalem, show us that the consummation of Christ’s loving and giving is New Jerusalem. *Verse numbers without a book name are in Ephesians. ** Part of footnote 1 on Ephesians 5:25 in the Recovery Version Bible, footnote written by Witness Lee, Bible © 2017 by Living Stream Ministry. Ephesians 5:27 tells us that Christ will “present the church to Himself glorious, not having spot or wrinkle or any such things, but that she would be holy and without blemish.” This church is His well-prepared bride, the forerunner of New Jerusalem. Christ cares for the church, “cleansing her by the washing of the water in the word.” This corresponds with Revelation 21:2, “New Jerusalem…prepared as a bride adorned for her husband.” His washing prepares the bride. Also, we cooperate with Him. For example, holding to Him in love that His rich supply may flow out. 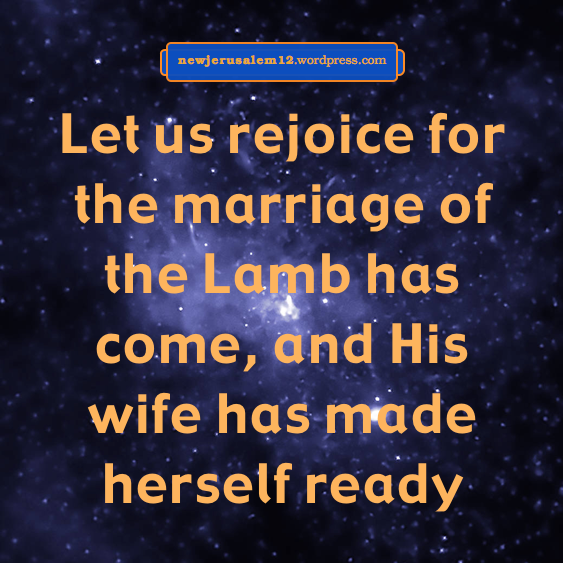 This corresponds with Revelation 19:7, “the marriage of the Lamb has come, and His wife has made herself ready.” Our cooperation prepares the bride. holy, without blemish, in love. Lord, keep us loving You every day from now to New Jerusalem! Both are in the Recovery Version Bible, © 2017 by Living Stream Ministry. “According to His promise we are expecting new heavens and a new earth, in which righteousness dwells” (2 Peter 3:13). This new creation is presented to us in Revelation 21:1-2 with New Jerusalem as the site of God’s throne. The Bible speaks of both the earth and the world. The earth was created by God for His purpose but the primary meaning of “world” in the Bible is the system created by Satan to take men away from God. The Lord Jesus told us, “Now is the judgment of this world; now shall the ruler of this world be cast out” (John 12:31). He accomplished this by His death. The world is still around us because the judgment on the cross has not yet been brought to conclusion. This is like a person pronounced guilty by a judge in a law court. The verdict is final but it takes some time to transfer the criminal to prison. This is why the Lord asked the Father to “keep us out of the hands of the evil one”—the cast-out ruler—who is the source of the world (John 17:14-16). In Revelation 20 the executing of the judgment on the world will be concluded. The devil and everything originating with him (including the lust and vainglory of the world – 1 John 2:16) will be cast into the lake of fire. As a result, the new earth will have New Jerusalem but will not have any world. The Lord told us, “take courage; I have overcome the world” (John 16:33). Now, by regeneration, He is the Overcomer in us: “everything that has been begotten of God overcomes the world; and this is the victory which has overcome the world—our faith” (1 John 5:4). The new heaven and new earth with New Jerusalem is our goal. May God keep us from the world, even though we outwardly are living in the world. 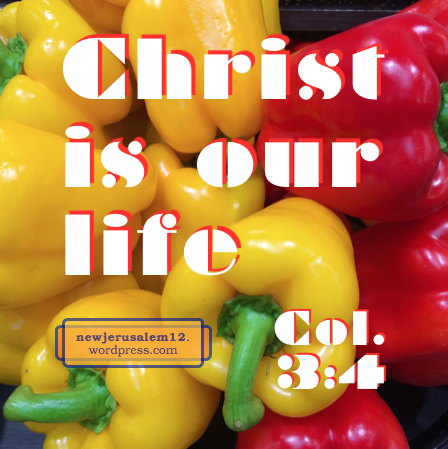 Inwardly Christ is life both today, in the coming age, and in New Jerusalem. God created the earth and man for His purpose. Man was deceived by Satan and captured by the world, but God in Christ saved us. The world was judged and will be totally eliminated and God will gain a new earth with New Jerusalem for the fulfillment of His eternal purpose. In Christ we are not of the world, but the world remains around us and attracts the fallen portion of our being. We need to cooperate with the regenerated part of our being to overcome the world. 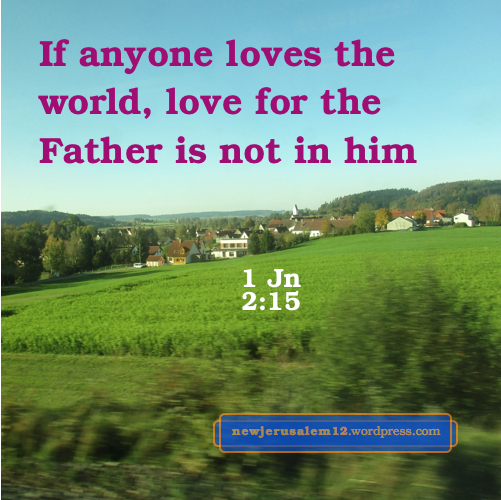 Like James, John warns us about the world, “Do not love the world nor the things in the world. If anyone loves the world, love for the Father is not in him; because all that is in the world, the lust of the flesh and the lust of the eyes and the vainglory of life, is not of the Father but is of the world” (1 John 2:15-16). John also encourages us, “And the world is passing away, and its lust, but he who does the will of God abides forever” (v. 17). Our secret to overcoming the world is to love the Father to let Him energize us to do His will. Then we “abide forever,” being in New Jerusalem. First John 2:17 is similar to the Lord’s word in John 14:23, “If anyone loves Me, he will keep My word, and My Father will love him, and We will come to him and make an abode with him.” Again, our love is the key. Then the Father and Son can be active within us and their presence will save us from the attractions of the world. Father, I love You! Lord Jesus, I love You! Strengthen Your abode within me now and unto New Jerusalem! Bible verses are quoted from The Holy Bible, Recovery Version, published and © by Living Stream Ministry, Anaheim CA, 2003. The New Testament of this Bible, with its outlines, footnotes, and cross-references, is at online.recoveryversion.org; this too is © by LSM. We are growing and being perfected in our Christian life. Our maturity in life and our perfection (Matt. 5:48) match New Jerusalem. This is not merely human maturity and human perfection; rather, it is Christ growing in us, Christ formed in us (Gal. 4:19), Christ making home in our hearts (Eph. 3:17). Christ in us becomes our maturity and perfection. In 1 John 2:5 His word is for our perfection: “whoever keeps His word, truly in this one the love of God has been perfected.” In John 14:23 the Lord Jesus said, “If anyone loves Me, he will keep My word.” On one hand we need the word for our perfecting in love. On the other hand we need love to keep the word. Growth in Christian life is often bidirectional like this, not a matter of a sequence of steps. Lord, keep me loving You and Your word. 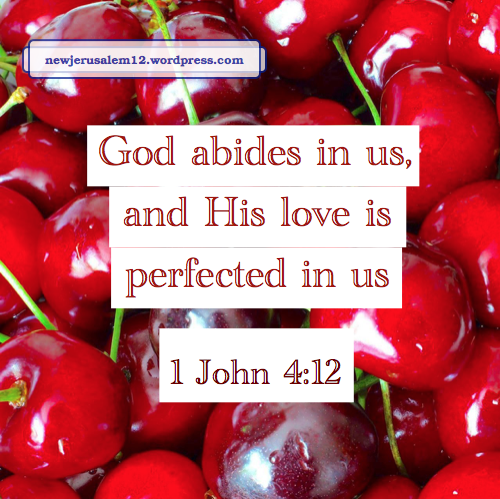 God’s love is perfect, but there is a need for it to be perfected in us. This perfection saves us from all other loves, as in 1 John 2:15. And this perfection prepares us for New Jerusalem. Then in verses 16-17 God is love in us. We open ourselves to this love, and then we and God have a mutual abiding and His love is perfected in us. Again, it is God in Christ perfecting us by being formed in us. Our cooperation with God’s perfecting work in us is the preparation of New Jerusalem. While we are growing in our Christian life we are also being perfected. Our maturity in life and our perfection (Matt. 5:48) match New Jerusalem. The result of transformation is that we corporately show forth the will of God. This will is good, in God’s sight, as is New Jerusalem. However, there may be outward events which help our transformation, which are not “good” according to our understanding. 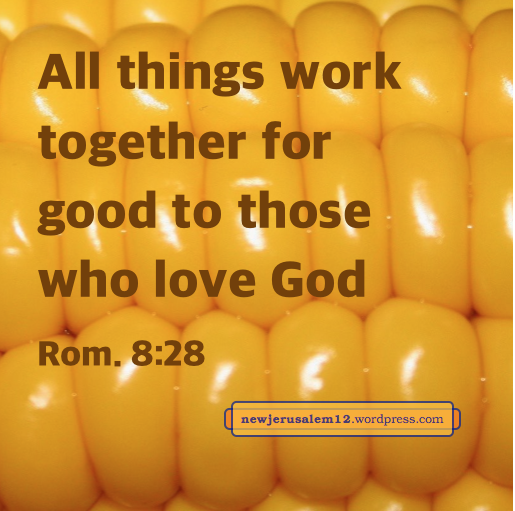 In the same way, Romans 8:28 tells us that “all things work together for good to those who love God.” Again, this is God’s view of “good” and it applies to those who love God, those who are foreknown and predestinated by Him in eternity past to go through a process in order to be glorified (8:29-30). This glory ultimately is New Jerusalem. Our transformation, the renewing of our mind, includes a change in our concept of “good.” God’s view of “good” is that we be transformed, conformed to the image of His Son (8:29), and glorified for New Jerusalem. This is far beyond a good job, a good, car, a good vacation, good food, etc. Paul was pursuing God’s “good” (Phil. 3:12-14). Hence, in physical things he was content to abound or to be abased (Phil. 4:11-12). The will of God in Romans 12 is well pleasing to Him, and to us when we are one with Him. God has predestinated us from eternity for His good pleasure (Eph. 1:5). And His good pleasure consummates in eternity with New Jerusalem. The will of God, including New Jerusalem, is perfect since God is perfect.